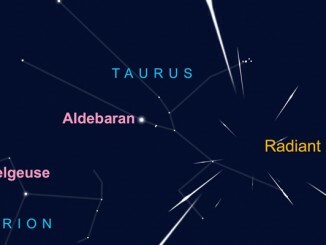 While the Quadrantid meteor shower can produce upwards of 100 shooting stars per hour at its peak, the main activity is centred on a brief six-hour window. This year, the International Meteor Organisation (IMO) predicts that the Quadrantids will peak at 2pm GMT on Tuesday, 3 January 2017, favouring observers in the west of North America. Observers in the UK and Western Europe should make the most of clear skies in the pre-dawn of 3 January, or after the crescent Moon has set the same evening. The shower’s radiant lies in northern Boötes, high in the east around 6am GMT for observers in the British Isles. AN graphic by Ade Ashford. 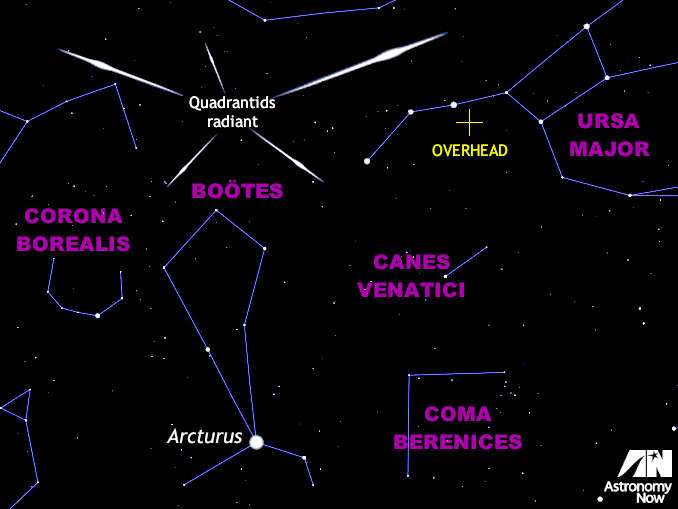 If you enjoyed the spectacle of terrestrial fireworks at the dawn of 2017, then it’s time to direct your attention skyward for some celestial pyrotechnics from the first major annual meteor shower — the Quadrantids. The shower is named after the constellation in which the radiant (the point in the sky from which the meteors appear to originate) resides, but you won’t find Quadrans in any contemporary star atlas. Now sadly defunct, Quadrans Muralis (the mural quadrant) was created by Jérôme Lalande in 1795 and occupied the space between our present-day constellations of Boötes and Draco. For its 28 December—6 January duration, the Quadrantid radiant lies in northern Boötes. The source of the Quadrantids is most likely a small solar system body known as (196256) 2003 EH1 that was discovered in March 2003. It completes a circuit of the Sun every 5.52 years in a highly inclined, eccentric orbit and last came to perihelion in March 2014. 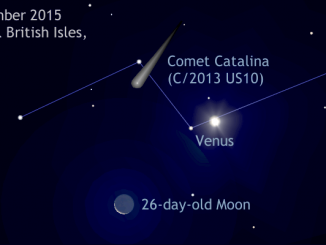 Most likely an extinct comet, it is the debris from 2003 EH1 scattered along its orbit that the Earth intersects in early January each year. The Quadrantids have the potential to put on an impressive display rivalling that of the August Perseids or the December Geminids, with figures of 60 to 120 meteors per hour often quoted — if you happen to be watching at just the right time. Quadrantids are slow to medium speed meteors, formed from particles of 2003 EH1 entering the Earth’s atmosphere with velocities of around 43 kilometres (27 miles) per second, with brighter examples often appearing yellow and blue. About ten percent of these will leave persistent glowing trails, too. So why is it such an underobserved shower? The problem lies in the fact that most of the peak Quadrantid activity occurs within a six-hour window centred on a short, sharp maximum. The International Meteor Organisation (IMO) predicts that the shower will peak at 2pm GMT on Tuesday, 3 January 2017. Since this is obviously in daylight for the UK, the maximum favours observers in the far west of North America. For UK observers, the best time to mount your vigil might be the pre-dawn of 3 January before astronomical twilight starts around 6am GMT, or after moonset the same day (~10pm GMT). Faintest meteors are the most plentiful, so to maximise your chances you should find a safe location that is as far removed from streetlights and other sources of light pollution as you can and allow your eyes to become fully dark adapted. Ensure that you are dressed in multiple layers of clothing with warm boots or shoes, gloves and — particularly important — a hat, since a large proportion of heat is otherwise lost through the head. A garden lounger chair and a thermos flask of your favourite hot beverage is a good idea as you’ll be still for long periods during your watch. Observing in company is always more fun too! Don’t concentrate on the radiant but at a point about 40 degrees (or twice the span of an outstretched hand at arm’s length) to one side of it and about half way from the horizon to overhead. For a comprehensive guide to observing all that is happening in this month’s sky, tailored to Western Europe, North America and Australasia, obtain a copy of the January 2017 edition of Astronomy Now. 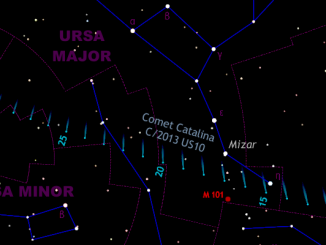 Comet Catalina (C/2013 US10) is currently a morning object in Virgo low in the southeast before dawn twilight for UK observers. The comet has a photogenic close encounter with Venus and the waning crescent Moon on the mornings of 7—8 December, then rapidly heads north through the constellation Boötes for a closer brush with Arcturus on New Year’s Day.